Pumpkin Overnight Oats are a healthy gluten free twist on the classic pumpkin pie. Made with pure pumpkin, cozy spices and hearty oats. 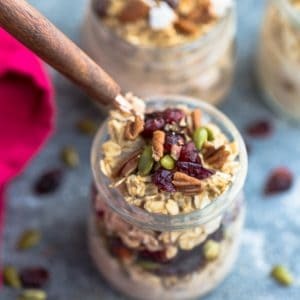 Add oats, milk and chia seeds together in a mason jar, resealable container or a bowl. (If you like your oatmeal more creamier, you can add more milk and less if you like them on the chunkier side - you can also add an extra 2 tablespoons yogurt (dairy free if needed) to make them creamier). Stir in maple syrup, pumpkin, pumpkin pie spice, cinnamon, pecans, pepitas and cranberries. Enjoy cold or heat up in the microwave or stove-top. Serve with more milk as desired and top with more pepitas and cranberries before serving, if desired.